We are a leading Manufacturer of legrands switch gears from Coimbatore, India. 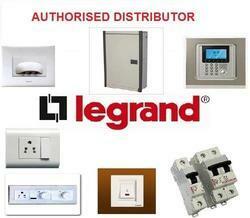 Legrand is a global specialist in electrical and digital building infrastructure. Today, globalization is changing lifestyles and customers are asking for more smarter and sleeker solutions. Strengthening the brand philosophy of “Listen, Design, Make, Support” and responding to these requirements of the market. Legrand has introduced several smart innovative solutions to address their needs. In India, Legrand has been a leader in the protection business for the last four decades with a wide range of circuit breakers and distribution boards. Taking advantage of this strong position and the expertise of the group, Legrand India has progressively developed additional product ranges like wiring devices, home automation, door entry, lighting management system, cable management and structured cabling to its product offer. With 25 offices spread across the country, and an extensive network of over 600 distribution partners and more than 7400 retailers, Legrand proposes a complete solution for every project be it residential, commercial, hospitality or industrial.